There are still — still! — tons of business owners who don’t believe Facebook (or social media, in general) is a valuable place for them to spend their marketing dollars. I’d like to submit that it may be the BEST place to spend your marketing dollars — if you care about ROI and overall effectiveness, anyway. But who cares about marketing that makes money anyway?! If you’re a skeptic or need to convince a skeptic, take a look at the numbers below from the Pew Research Center’s Social Media Update 2016 report. I’ve summarized the main points for you with a focus on Facebook and Instagram here. Good luck getting that targeted with a tv or radio ad (you can’t). It’s tough to get that targeted even with Google Adwords. One argument I often hear from business owners against marketing on Facebook is, “people are on Facebook for personal stuff and we sell business to business stuff.” The problem with that logic is that people watch tv almost exclusively for personal reasons and I certainly see a lot of b2b ads there. If you’d like to argue that you only see those b2b ads during golf games and such, that’s fine. You can still get even more targeted than that on Facebook — waaaaaay more targeted. Do you think Facebook keeps the fact that you like golf a secret from marketers? If so, keep kidding yourself. I also hear, “I just don’t think [type of professional persons] are on Facebook.” Look, maybe your favorite client is not on Facebook but other prospects are almost definitely there. People simply like keeping up with old friends from high school, seeing extended family, and seeing pictures of their grand kids. On that note, the other argument I hear is, “our market is mostly older and they aren’t on Facebook.” If you’ve made that argument, simply look at the breakdown by age and re-think it. 62% of people 65 and older are on Facebook. One other thing to mention about Instagram is that whereas Facebook’s gender distribution is fairly even, Instagram shows a bit more disparity between men (26% use Instagram) and women (38% use Instagram). Instagram is an amazing platform where people are building personal brands seemingly out of thing air (and tons of hard work) and companies are building massively profitable followings for their brands by consistently delivering strong content that delivers value of some kind to their customer and market bases. Instagram’s overall use as a percentage of people online did not increase much between 2015 and 2016 BUT I think the total numbers will grow along with the age of the users. That is, those in the 18-29 group will move into older categories and keep using it. Additionally, the platform has had pretty stiff competition from Snapchat in the last few years but recently added a features (such as Instagram Stories, a total copy of Snapchat Stories) which I think will keep the younger users more engaged (and maybe even get them off of Snapchat). They’re hooked! 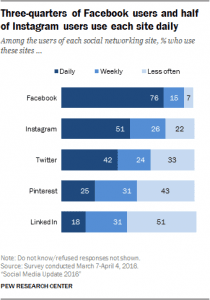 76% of Facebook users and 51% of Instagram users use the sites daily. Most things this addictive have to be eaten, drank, or smoked. Humans have always liked local-interest, personal stories in their newspapers and reading materials — and that’s all these platforms are. With each like, love, share, heart, comment, and click the platforms mold themselves to what we like to see. And then… they show us more of that. It’s addictive. Even physiologically-speaking, it’s literally addicting. We get to scroll and click and scroll and giggle, and our brains get little flushes of pleasure-inducing dopamine. And you can take advantage of that through ultra-targeted marketing! Yeah, I get that it sounds a little creepy when you say it like that but that doesn’t make it any. less. true. At all. Not one bit. Here’s the thing: If you’re using paid ads, you don’t have to be all into social media. If you don’t want to get into Facebook; fine! You don’t have to but you should definitely consider that many of your customers (or, prospective ones) might be on Facebook — and YOU have the opportunity for your ads to be right there next to the video of their grand kids or the funny golf video or the one with the kid on the skateboard who jumps off the roof or the deer that starts fighting the hunter. Yeah, your ad could be there, too. If you have any questions or would like some ideas about how social media could work for your business, contact us online or call us at 832-900-2000.